The fifteen photographs that comprise this collection were made with black-and-white film then hand-tinted with the three primary food colors found in the baking section of supermarkets. Hand-tinting is playful and poetic but can also serve as commentary. In a city where concrete is king, nature survives only when painted on walls, or as graffiti. In other moments, the accidental is celebrated, like the juxtaposition of a children’s playground that seem surreal, or the tread marks made by two cars backing up, then moving forward in opposite directions, generating two hearts in the snow. Selective coloring fuses fantasy with reality­, asserting the imagination over the mundane, as per cover photo of a woman walking in a snow blizzard past a mural, or the car tire that secretly desires to be a flower, or the scattered aluminum soda can-tops that shimmer like eye candy. Hand tinting awakens bland moments as spice transforms food. Here are a few of my dishes—bring your eyes close and taste! 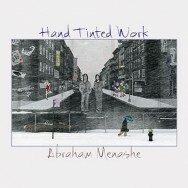 Hand-Tinted Work, by Abraham Menashe, available from iTunes.